I love granola. And I love peanut butter even more. 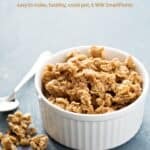 So, when I saw a recipe for slow cooker peanut butter granola in Fix-It and Forget-It Big Cookbook: 1400 Best Slow Cooker Recipes (affiliate link) it immediately caught my eye. I’ve made Peanut Butter Granola Bars, but never peanut butter granola. And it’s been more than a year since I made my last batch of homemade granola: skinny pumpkin granola with quinoa and cranberries. So, it was more than time for me to make me some. And I was excited about using the slow cooker. The original slow cooker peanut butter granola recipe called for a full cup of butter, not exactly Weight Watchers friendly. I replaced it with 6 tablespoons of oil and also reduced the sugar quite a bit. The great thing about granola is there’s really no wrong way to make it. Unfortunately, I learned the hard way that you can burn granola in the slow cooker, if you’re not paying attention. It’s important to keep your eye on it and give it a stir every 20 minutes or so. If you’re like me, a terrible multi-tasker who easily gets lost in her work, be sure to set a timer! This makes a big batch, 8-1/2 cups, of slow cooker peanut butter, filled with all my favorite things including coconut, sunflower seeds and peanuts. Feel free to mix and match ingredients according to your tastes. This recipe is easy to cut in half too, which is what I plan to do next time. According to my calculations, each 1/4-cup serving has about 162 calories, *4 Weight Watchers PointsPlus, *6 WW Freestyle SmartPoints. Enjoy! 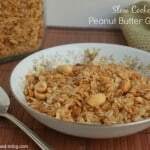 If you’ve made this slow cooker peanut butter granola, please give the recipe a star rating below and leave a comment letting me know how you liked it. 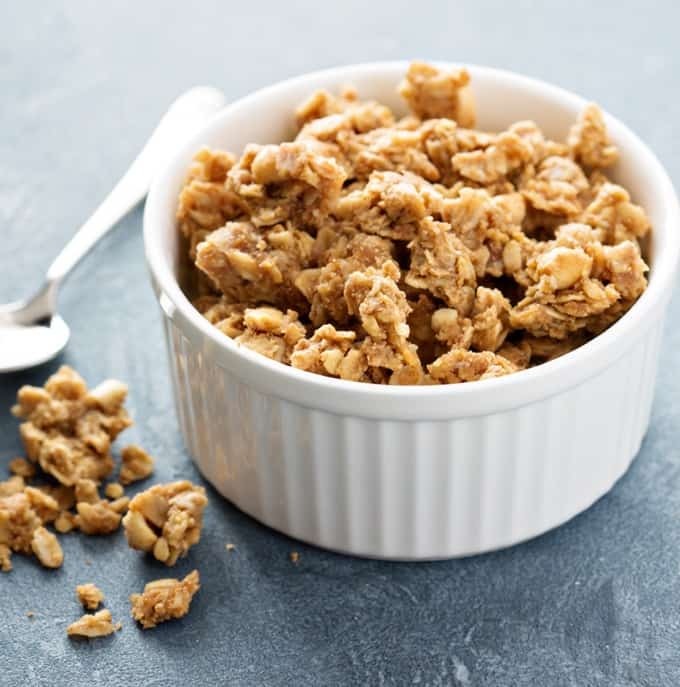 Crunchy, delicious and filled with all my favorite things, like coconut, sunflower seeds and peanuts, this slow cooker peanut butter granola is a winner in my book. Ideal slow cooker size: 6-Quart. Combine rolled oats, wheat germ, coconut, sunflower seeds and peanuts in your slow cooker. In a small saucepan melt together the peanut butter, brown sugar, oil, water, maple syrup and cinnamon, until well blended. Pour peanut butter mixture over the oats in your slow cooker. Toss together until everything is well mixed. Cover, leaving the lid slightly ajar to allow moisture to escape. Cook on LOW for 2 to 3 hours, giving it a stir every 30 minutes or so. It's done when the granola is golden, dry and smells wonderful. Cooking times will vary greatly depending on your slow cooker. Keep an eye on it so it doesn't burn, especially as it gets closer to being done. Spread the granola out on a cookie sheet and let it cool completely. When completely cool, store in an airtight container. 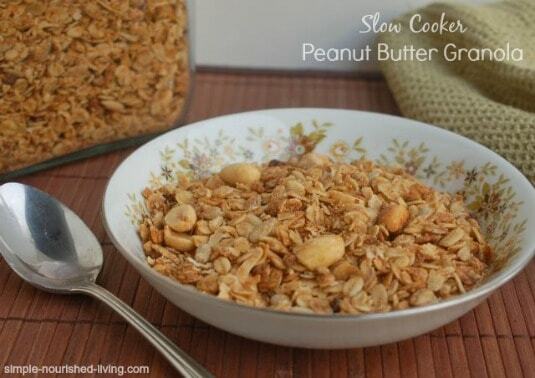 Here’s what I used to make this Yummy Crock Pot Peanut Butter Granola! When I started WW to save points, I started using Better Butter (peanut butter). Do you think it will work in this granola? Plan to make either way. I’m not sure, since I’ve never used it, but I don’t see why not. Would love to hear how it turns out if you do use it!! Do you think leaving out Wheat Germ that the recipe will turn out alright? Hi Bridget, It should be fine.